Ocean front beach vacation rental on studio drive and pet friendly! 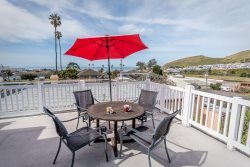 Come enjoy the beautiful clean beaches of Cayucos and stay in this one of a kind beach house!! Newly renovated 3 bedroom/3 bath. This ocean front, single level home is appointed with oversized windows and amazing views of the beach. 1st bedroom has California King bed, 2nd room has one Queen size bed, and the 3rd bedroom has two twin beds. Two bathrooms are in the home, with an additional bathroom with second shower in garage to rinse off after your day at the beach. Enjoy a lovely afternoon on the sand and watch the sunset from the large deck. 22" Charcoal BBQ, W/D, dishwasher,and Wireless Internet, Fire Place, Public Access TO BEACH is just two homes to the South. VACATION READY. PET FRIENDLY! Comfortably sleeps 6 people, please bring a blow up mattress to accommodate 8 guests. Everyone has been great to work with. We've stayed two years at A World Away and enjoy it very much - especially since we can bring our dogs. Quick responses and very friendly. Loved the house and the view. Downsides were the garage door in the master bedroom and the 3rd bathroom in the garage. Beachside Rentals' staff is great. I worked closely with Sarah and she is fantastic. . .so helpful and informative. . .and always with a smile! 050 was the perfect place to stay for that beach getaway!